Your first thought as you approach Bay Branch Farm in the Cleveland suburb of Lakewood is that the GPS must be wrong. Surely the source of some of the area's best arugula and other produce can't be located here, in this lower-middle-class neighborhood of densely packed homes that were built as employee residences for a nearby Union Carbide plant. 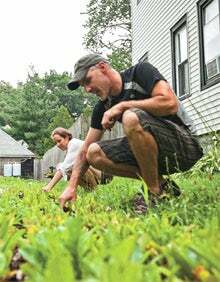 But if you drive slowly enough, you'll spot the rows of neatly planted vegetables in the pocket-size yard of a weathered 1920s house: the off-hours endeavor of two gainfully employed professionals, Annabel Khouri and Eric Stoffer. Khouri is a Peace Corps recruiter who spent her childhood on 75 acres in Vermont. "My dad's whole vision was to live off the land," she says. "I didn't appreciate it as a kid." Stoffer is trained as an engineer but works as a programmer. Both his parents grew up on a dairy farm, a vastly different proposition. "When he heard what we were trying to do, my dad was like, ‘You'll need at least 50 acres,'" he says. Now they're considering a career change to farming. To see if they like it, they've dipped a toe in the water with this backyard plot. In 2010, their first year, they grossed $5,000 without marketing or advertising. "We just grew some food," Stoffer says, "and tried to see if we could sell it." Despite a late growing season, this summer has gone better. A total haul of $8,000 seems likely, a 63 percent growth rate that would be the envy of most companies. "Our biggest expense is absolutely our labor," Stoffer says. "We're making like $2 a day." Bay Branch has sold to several neighborhood restaurants, and the stand is a hit each Saturday at the Lakewood farmers market. "If you grow really good food, there's a market for it," Khouri says. The farm already has its followers ("If Annabel grows something, I'll buy it, whatever it is," says local chef Ricardo Sandoval) but consumer sales can be more challenging. "Our arugula is $3 for a quarter-pound bag," Stoffer says. "That's kind of expensive. And sometimes it's hard to explain why to people at the retail level." Over the course of two years, Khouri and Stoffer have learned that microfarming is precarious. Last year's carrots were a week away from getting harvested, for example, when a gopher came in and ate the entire bed. When you're only growing an eighth of an acre in all, the loss of even those 40 square feet of production is significant. Still, the experiment seems successful enough that the couple is actively looking for a piece of land to purchase. "Our goal is to stay small enough that we don't ever need a tractor," Stoffer says. Whether they can make a living on that scale is open to question, but as Stoffer points out, the lifestyle includes ancillary benefits. "We never have to go buy produce at the store," he says. "So if nothing else, we save money that way."